The Honda GL 1500/6 is a Japanese made touring motorcycle built between in 1991. It has a water cooled, flat six, four stroke 1520 cc engine; with a top speed of 118 mph (189.9 km/h). 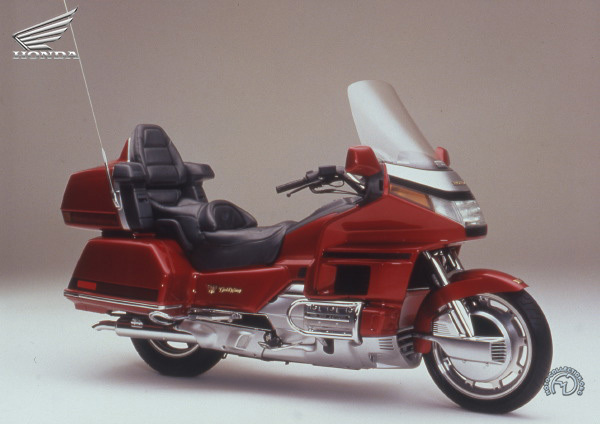 "The Gold Wing 1500/6 is the biggest, most lavishly equipped and one of the most expensive two-wheelers in the world. Aimed squarely at the US market, it has a flat-six engine - just like a Porsche! - displacing 1520cc, the biggest power unit currently in production. Honda was already planning a six-cylinder superbike as early as 1972, when it built the prototype AOK air-cooled six. But the result of the project was the four-cylinder Gold Wing launched in 1974. To compensate for the "loss" of two cylinders, the bike gained liquid cooling. And as the years progressed, the four-cylinder Gold Wing evolved steadily, becoming larger and more sophisticated. When the Gold Wing at last appeared with a water-cooled six-cylinder engine in 1988 as the GL 1500, fears that Honda might at last have gone too far proved unfounded. On the open highway, the GL 1500 is both stable and extremely comfortable. It can reach almost 120 mph in virtual silence with - thanks to its fairing - excellent protection from wind and weather. Once it is on the move, there is no hint that this bike weighs a massive 850 lb. It has surprisingly delicate handling and its six-cylinder engine is unbelievably flexible. It boasts a reverse gear that acts through the electric starter motor, an assisted central stand, and a four-speaker radio with jack plugs for the riders' helmets.